HELLO AGAIN WORLD. I'm back. Forgive me for disappearing? Thanks/Sorry. I thought I would take you through my planning process and share with you what I'm planning to make and how I'm going to make it happen. A lil Thanksgiving inspo for you! Last year, me and two friends did a full Thanksgiving for 15. We planned ahead of time and treated the cooking as the real celebration and it was a hit. My dream is that we're going to host the meal outside, but we'll see how the weather holds. As of now, we're going to have 12 people (including one child.). I'm straying from tradition a lot this year, which I'm excited about because I think that usually Thanksgiving food is pretty lackluster. I'm adding links to many of the recipes that I'm using at the bottom of the page if you'd like to use them! F*** it if it's not fun. For example, I could make my own flatbread or make my own spicy pecans, but I think the work involved in that is not worth the reward. I am lucky enough to live in an area where there are tons of great food producers who, frankly, will do a better job than I will making a lot of these things. I'm doing the things that I think will be fun, but taking those things off my list that will push the prep into stressful territory. This line is different for everyone and (duh) there's no shame in contracting out! Everything will not be perfect, but it will be good. I will do most of the work ahead of time in order to set up the majority of the meal. If you get to that point before anyone even gets there, catastrophic failure is almost impossible. I break everything into 4 main sections - 1 week ahead, 2 days out, the day before and the day of. Here's how I'm planning things out. 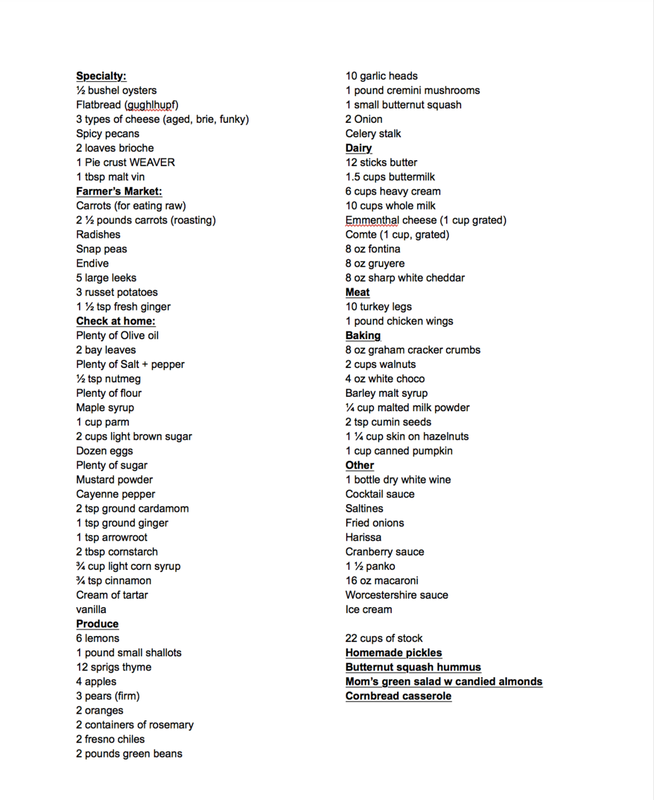 Once my recipes are chosen and I know where I'm headed, I make my grocery list by writing down everything that every single recipe calls for and then condensing those so I know how much I need of everything. For things like butter and flour, I like to make sure I have more than I need. I always round up on lists like this. That's a good list right there. I'm also making the shallot confit, the gravy and the stock a week ahead of time. I'll also print out all the recipes ahead of time and have them in sheet protectors because WATER. Below is my detailed to-do list, which includes both skilled and unskilled tasks. In my opinion, the oven schedule for the day of is the most important part of this. It allows me to turn turn off my brain and just follow along, which allows me to actually enjoy myself! I recommend you do the same. To make your own schedule like this, work backwards from the time you want to serve the meal and think about what has to be done when. For example, the salad needs to be dressed at the very last minute. Write things down - I like to do it on a computer so I can change it as I think about it and then print it out for the day of. On Tuesday (or before) the grocery shopping will be done. That evening, I'll make sure the kitchen is clean and that all the surfaces are cleared off so I have plenty of work space. I'll also clear out the fridge to make space. I will do absolutely everything I can the day before. Label serving dishes, set the table, cook most things and prep what I can't. This is the day for coffee and loud music and, to be honest, is the day I am looking forward to the most in this holiday. For dinner, we'll order take out and lay on the couch. Invite your most kitchen-inclined guests to join you if you want some company - that's what I'm dong. The main thing I'll do the day of is finalize dishes and set things out. I'll put the crispy onions on the green bean casserole and the breadcrumbs on the macaroni and cheese and get them warm. As I mentioned, lots of things will be served at room temperature, but whatever isn't will be warmed according to the schedule above. And then I'll enjoy myself. I hope you will, too. What are you most looking forward to and most dreading on Thanksgiving?